Click on any of the images to view them full-size. Where to find the five naked eye planets during September. 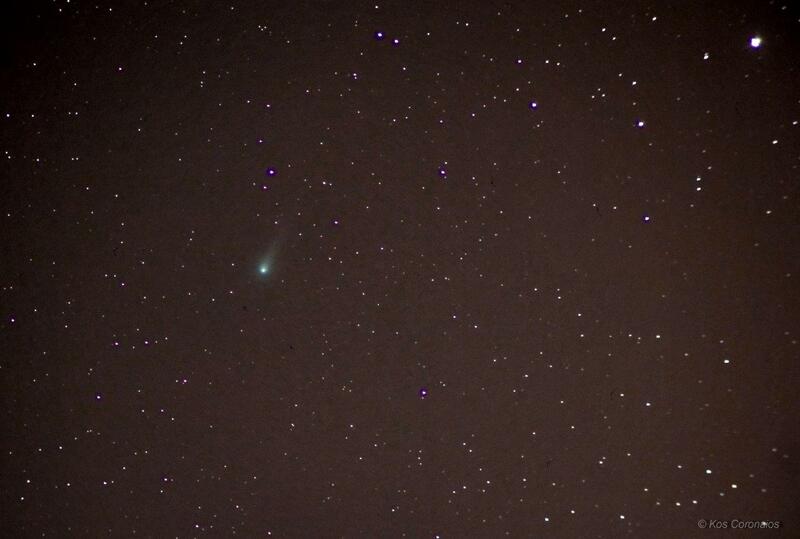 Comet Siding Spring and Mars. Latest stats on spotless days. Click here; September 2014 newsflash for the month’s newsflash. There was no noticeable difference in last month’s Full Moon rise in terms of size or brightness to the naked eye, but this is easily noticeable when comparing the pictures below. Both were images taken with Canon EOS 60D at prime focus of 10-inch f4 Schmidt-Newtonian. 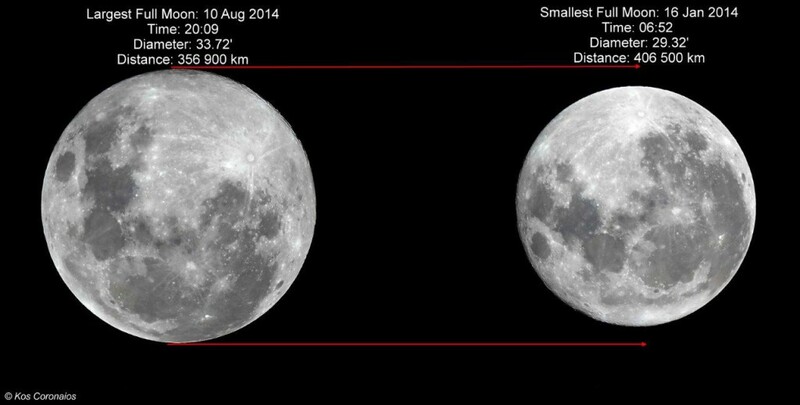 There was a time difference when shooting the smallest Full Moon at 21:35, nearly 14.5 hours after apogee, which was at 06:52, perigee image (largest) was taken at 20:05 and therefore any differences were negligible. 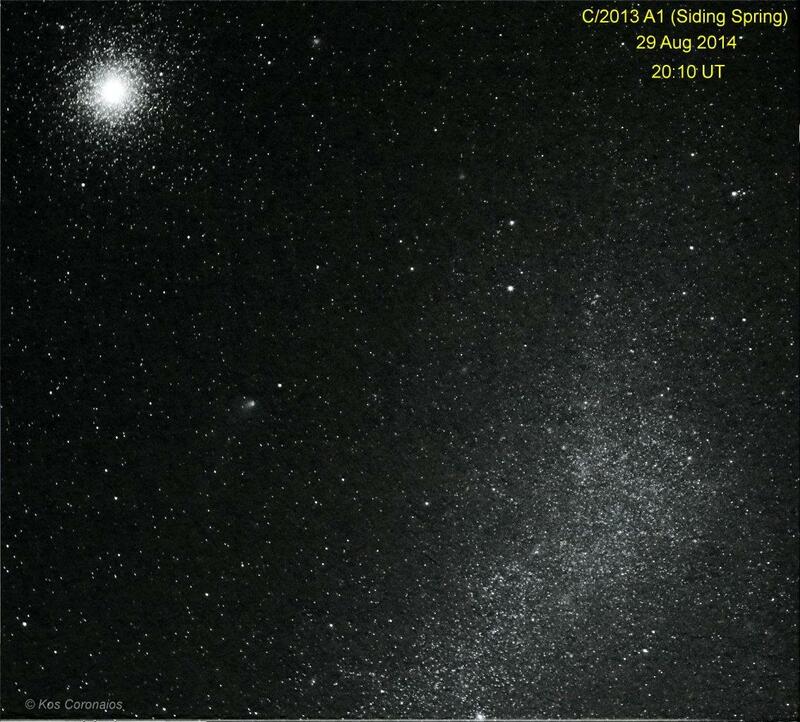 Comet C/2013 A1 (Siding Spring) passing between NGC 104 (47 Tuc) and the irregular galaxy NGC 292 (The Small Magellanic Cloud) in the image below. This is one of the comets making headlines as it heads towards perihelion on the 25th October, skimming close to Mars a few days earlier on the 19th. More in the newsletter…….! Where to find the five naked eye planets during July. Traces of another world found on the Moon. Oldest known potentially habitable exoplanet found. Antares region and our winter skies. Comet PANSTARRS (C2012 K1) at around magnitude +8 was a binocular target during June and will probably remain one, at least for the first couple of weeks into July. Unfortunately the Moon starts to hinder observations during this time. Full Moon is on the 12th of the month and if the comet is still at a reasonable altitude above the western horizon, seeing conditions will improve. The image below shows the movement of PANSTARRS over a couple of days as it “zoomed” past the 4.5 magnitude 21 Lmi (HD 87696). The image below was taken on the 19th June. Click on it, to view full-size. Discovered on 17th May 2012 from the summit of Haleakala (Maui, Hawaii) with PS1, a pair of 1.8-m Ritchey-Chretien telescopes equipped with the largest digital camera ever built. At a feeble 19.7 magnitude (8.7 AU from the Sun) when discovered, in theory the comet could brighten to magnitude 6 as it moves towards perihelion towards the end of August (27 August 1.05 AU). 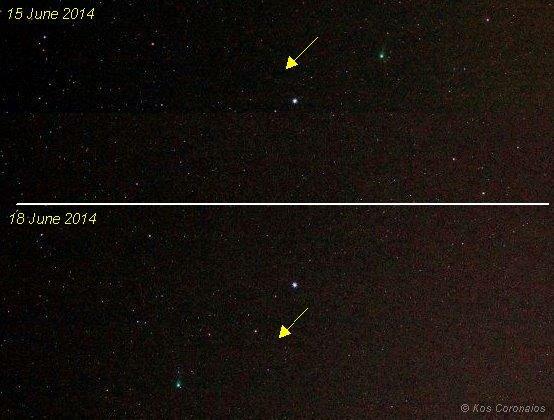 Comets are notoriously unpredictable so we might even see a naked eye apparition, or maybe not!